Yesterday we launched the #optimistnet_no_complains_challenge which is basically a challenge where each person can try to find how long he can stand without complaining about anything. 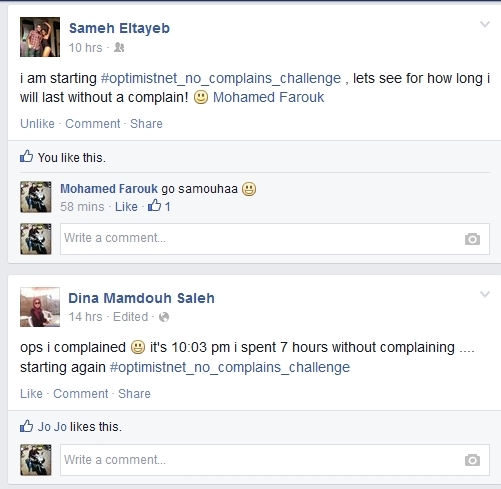 The challenge starts by writing the hashtag #optimistnet_no_complains_challenge along with the start time as a status on any social network you use to see how long you can hold without complaining about anything. After you complain for the first time you have to write down the time you spent without complaining as a status. Accept the challenge and give it a try! Login into your favorite social network then write the start time along with the hashtag #optimistnet_no_complains_challenge. Be honest and admit it when you complain. Note that you can always reset the counter and start again after you make the first complain. You will only understand how your life will improve when you try it yourself. Even after few hours you will realize how many times you used to complain each day and you will start to notice how positive your life has became.